This skirt is seriously just the coolest. I'm a sucker for scenery prints, so there was no way this one wasn't going to catch my eye. I saw it debut on Unique Vintage and over Labor Day sales I almost got it. I asked my girlfriend if I could get away with wearing it year round and her response was, "I would do it!" Despite that encouragement, I didn't get this skirt then (I made other purchases I have yet to show off in blog-land...) but Doll Me Up recently added a "Coming Soon" section and a few weeks back I saw that this skirt would be coming to them shortly. This was music to my ears because I actually won a gift certificate to them over the New Year and have been holding out all year. When this haunted mansion skirt finally made it's debut I purchased it immediately, along with this perfectly matching Heart of Haute Estelle blouse (I've gotten super into Heart of Haute's tops, for what it's worth), and a Deer Arrow necklace that I have yet to wear on the blog. Style Details: As I mentioned, most of this outfit is from Doll Me Up. Definitely check out the store if you haven't already; they carry a lot of pieces from vintage loving girl's favorite brands! In regards to styling this outfit, I kept accessorizing minimal to none existent. I figured it was best as the blouse has a bow, I'm mixing prints, and every item is already a statement piece. 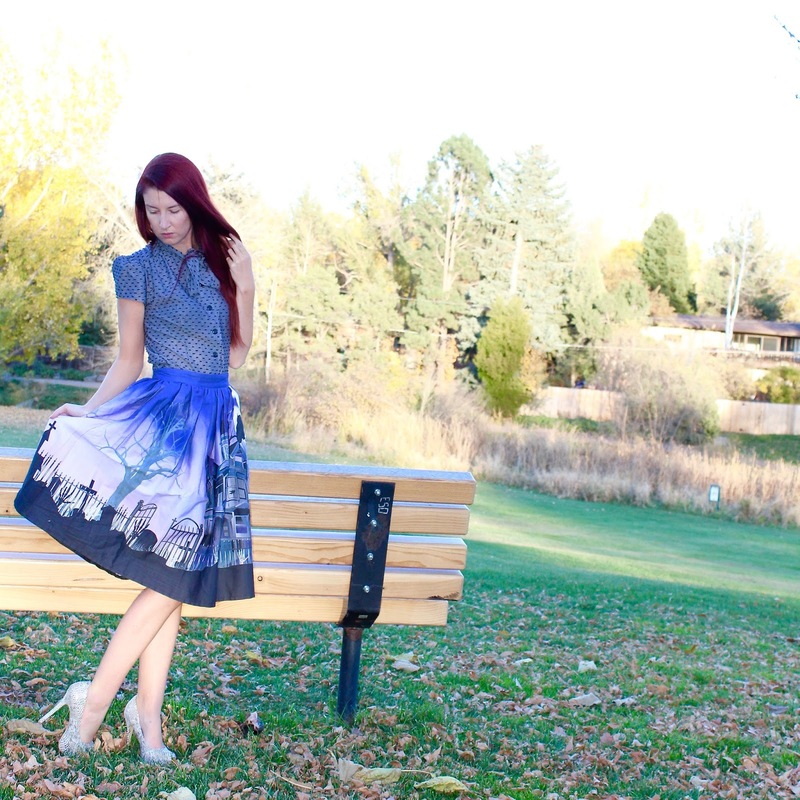 As you can see, the scenery print goes all the way around the skirt! I reviewed this exact style of skirt but in it's flamingo print over the summer. You can read more about that HERE to learn more about sizing and quality, etc. I'm still wearing a small, which I still feel runs a little bit large. I hope everyone is having a great week so far! Lovely in Lilac Collab #2-->Biking Through Brussels Dress Review-->Cherry Cherry-->Lovely in Lilac Collab!-->I'm Baaaack!!! Gorgeous look. I love your post. Dear Lauren Blair, amaaaaazing skirt, what for a great outfit! I agree with your friend! I loooved the skirt, I never thought of such a print, Haunted house :) You wear the best prints ever! That is a great alternative as well, for someone who doesn't want to wear scary makeup, and still be dressed for Halloween! You look amazing! I hope you are fine and having a nice time! Girl, this skirt was meant to be yours! It looks so good on you , I love the way you've styled it with the polka dotted shirt and that you kept a blue color palette going, which looks great on you by the way! Thanks so much for sharing and I hope you're having the best week so far, beauty! Of course you have the perfect skirt for the holiday! How fun. Love it on you. This skirt is AMAZING! It reminds me of the haunted mansion rides at Disney and Knoebels and I particularly love those rides lol. The top matches perfectly. This outfit would be fab if you werent dressing up in costume for Halloween. The more I look at this skirt, the more I want to buy it immediately haha. Have a great weekend Lauren! I don't usually go for skirts but I would be more than happy to wear that for Halloween, it's so freaking cool! Very nice outfit! Beautiful photos! Wow that is an amazing skirt!! I love this skirt! I'd totally wear it year round too! ;) Looks great on you Lauren! Your Halloween outfit is so pretty and not scary at all! Love this skirt on you.